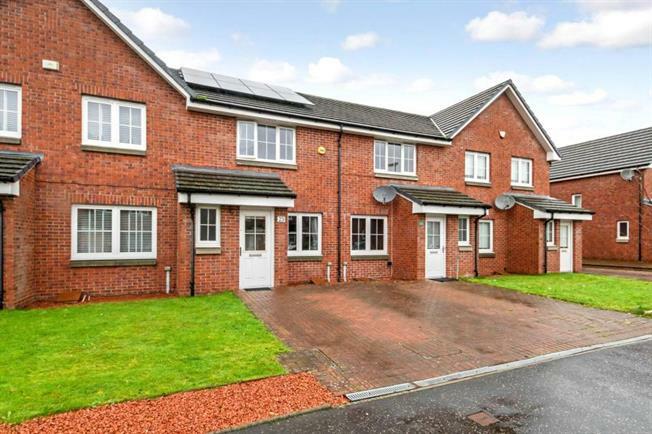 3 Bedroom Terraced House For Sale in Glasgow for Offers Over £125,000. This is a rarely available home in the popular development close to the city centre that would be an ideal purchase for young professionals. The house is accessed from a bright reception hallway that has a downstairs WC and has a modern suite. The spacious lounge has aspects to the front of the home and gives access to the dining sized kitchen to the rear. There is a modern kitchen that has a range of wall and base mounted units and built-in appliances and gives access to the enclosed rear garden. Upstairs there are three bedrooms, with bedroom one double in size. There is a modern family bathroom that has an over the bath shower. The house further benefits from, double glazing, gas central heating and drive. This home has truly been finished to a high specification throughout and early viewing is recommended to avoid disappointment. Springfield gardens is situated in close proximity to local amenities. There is schooling at both primary and secondary levels within the area and local amenities include recreational park, a nine hole golf course and much more. Local shopping can be found near by and there is also an Asda in Parkhead. The property is well placed for access to the M80 and M8 motorway network and public transport includes first links which provides access to the city centre and surrounding areas which have a host of bars, restaurants cinemas, theatres, universities and hospitals.